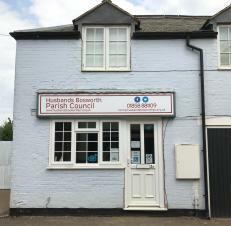 Husbands Bosworth Parish Council are delighted to be able to offer access to the new Parish Office to residents and parishioners of Husbands Bosworth. Our Clerk, Sarah Mason, is available four days a week to offer advice, answer queries and lend a friendly ear. No appointments are necessary, simply visit the office during the opening times and knock for the door to be unlocked. The Parish Office is also a referral centre for the Lutterworth and Villages Food Bank to support Parishioners in financial crisis. Find us at 2A Mowsley Road, just behind The Catering Corner. With a single staff member, the office will unfortunately be closed during periods of planned absence for holidays, external meetings, etc. Where a closure is planned, the closure dates will be added to this page, and the Parish Council Facebook Page. 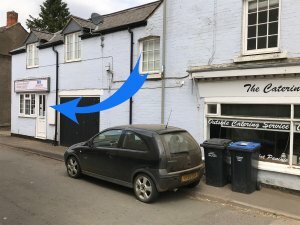 Regrettably, due to the age of the building, the entrance to the Parish Office is not wide enough to allow wheelchair access and there is a step up from the street to the office. 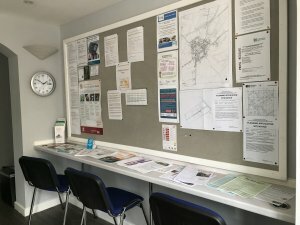 If you have access requirements and wish to speak to the clerk, they will be happy to step out of the office and chat with you outside, or please get in touch with the clerk to arrange a visit to your home.